In the summer of 1968, Reenie Kelly has just moved to Lake Liberty, Minnesota. She has been going through a difficult time ever since her mom died from cancer. The family has very little money, so her father has had to leave the children - Reenie and her older brothers, Dare and Billy - in the care of their grandmother while he goes to North Dakota for a job building roads. Billy, who was meant to go to college, must now pump gas to earn money, and worse, he worries constantly about being drafted to serve in Vietnam. To raise money to possibly help Billy pay for college, Reenie and Dare share a paper route. Reenie, who is highly enthusiastic about having a job, goes out of her way to introduce herself at every house where she will deliver papers. Only Mr. Marsworth, a reclusive pacifist who has been ostracized by his neighbors for many years, does not respond when she rings his bell. Unwilling to remain strangers, Reenie begins writing letters to Mr. Marsworth. Though clearly overwhelmed by Reenie's unfettered affection for him, Mr. Marsworth writes replies every so often, and through this correspondence the unlikely pair devise strategies for keeping Billy safely out of Vietnam and bring to light the long-lost secret of the connection between their families. My first thought about this book, on the heels of reading P.S. I Miss You was "Not another novel told in letters!" I appreciate that Dear Mr. Henshaw was the favorite novel of a lot of people when they were kids, but that does not mean newer books should imitate its epistolary format. When Reenie sent her first letter, the explanation for her wanting to reach out to Mr. Marsworth did feel a little gimmicky, and I was worried that the book was going to be tedious to read all the way through. But then I read Mr. Marsworth's first reply to Reenie, and his character came right off the page, fully alive, after just a few sentences. I knew him already, and could clearly hear his voice, after just one letter. After that, I realized that gimmick or not, the format of the book was going to take a backseat to the hearts and souls of these characters and their connection. It was so refreshing to read a middle grade novel that felt purely like a children's book, with a quintessential middle grade protagonist. I think a lot of today's children's authors are caught up in politics and activism and as a result, strong adult feelings on a variety of topics come through in their writing. This book, while very much about both politics and activism truly does not seem to have any agenda aside from telling a compelling story. This book not only develops a friendship between two endearing characters; it also gives readers a taste of how Americans reacted to the war in Vietnam. It explains the concept of conscientious objection in a way kids can understand and it also shows how the older generation of the time thought about Vietnam in light of the events of World War II when they themselves were young. The author, or at least the story, certainly seems to have a point of view on the issue of war, but it is not forcibly crammed down the reader's throat nor are characters automatically vilified for taking a different outlook. Some characters behave badly; others behave well. My dad enlisted in the Air Force during the time period in which this book is set, and though he was not a conscientious objector who opposed war in all forms, he did protest to bombing villages where women and children would be killed, and refused to do so. I grew up hearing stories of how scared he was to stand up for what his conscience told him was right, and how much of a relief it was when he was given an honorable discharge instead of a court martial. I also remember there were still people in my hometown who considered him a coward even 25 years later when I was hearing these stories. This book was probably a bit more appealing to me because of this personal connection, but I also liked that it rang true with my father's experiences, suggesting to me that the author did her research and that she presents a reality-based view of the historical events that inform this novel. I also loved that the Kelly family was Catholic, but that Catholicism is not the main focus of the novel. It was interesting to hear the characters comparing the Quaker religion to the Catholic faith, and pleasing to me, as a Catholic parent, to see mention of the characters attending Mass as though it were a perfectly normal and reasonable thing to do. After the horrible negativity toward the Church that I encountered in P.S. I Miss You, it was nice to have a more positive portrayal, even though there are only a handful of Catholic references. There are a few minor issues in this book: the font is tiny, and there are no chapters to break up the letters into smaller groups. The book is also dauntingly long at first glance, though I was able to read it over the course of an afternoon and evening with several interruptions, thanks in part to Reenie's fun and appealing voice. I also have to point out that the publisher's comparison of this book to The Wednesday Wars is not the most apt. Both are set during the same time, and Vietnam provides the backdrop to both, but in every other way they are very different books. I enjoyed them both nearly equally, but I wouldn't necessarily suggest one as a read-alike for the other. 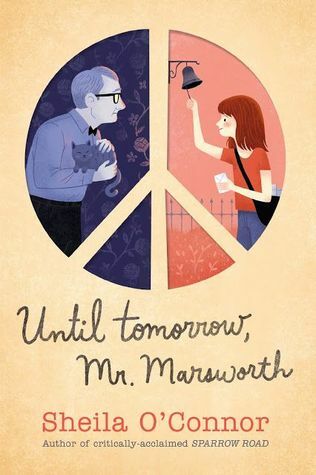 Overall, though, Until Tomorrow, Mr. Marsworth is an emotionally satisfying and completely child-friendly story about the effects of war on one family, and the importance of hope in the face of fear and adversity.